First practice was held on Wednesday morning and it quickly became apparent that the new F2 cars were very quick. Jim Clark put up a lap of 2m 17.5s in his Lotus 35, only 8s slower than the fastest lap in the previous year’s F1 practice. While Jack Brabham was given a time of 2m 16.8s for a later lap, even his own timekeepers couldn’t find when he’d done it. Alan Rees and Jochen Rindt both lapped in 2m 18.8s, while Jackie Stewart managed a 2m 19.2s in his Tyrrell Cooper-BRM, 1 sec quicker than Graham Hill in his BRM-engined Brabham. With the F1 drivers at Silverstone for practice there, the F2 regulars got a chance to put up some good times on the Friday. Despite this, there was only one or two real improvements made, with Mike Beckwith in his Brabham lapping in 2m 19.4s. Rees was .5s slower, while Maglia, Schlesser and Offenstadt also put up reasonable times. The third and final practice session took place on the Sunday morning, with all the F1 drivers back from Silverstone. Clark’s engine, which had been giving trouble, had been flown back to England on Friday, rebuilt on Saturday and flown back to Rouen in time for Sunday practice. With his engine now in mint condition, Clark flew around to record a 2m 17.1s time, two seconds faster than his team mate Mike Spence, and four clear of his other temmate Peter Revson, who futher blotted his copybook by crashing and damaging his rear suspension. Rindt used his teammate Rees as a slipstreaming device in order to improve his time to 2m 18.6s, with Brabham qualifying 3rd. Graham Hill managed to take almost 2 seconds off his Wednesday time to join Rees on the 2nd row of the grid. Stewart, Attwood and Gardner made up the 3rd row, with Mike Beckwith joining teammate Hulme on row 4. Bob Bondurant practiced only on the Sunday morning, but still managed to put his Tyrrell Cooper on the 5th row, alongside the Lotuses of Spence and Revson. It was an especially good performance from Bondurant, competing as he was in not only his first race at Rouen, but also his first F2 race. Maglia and Offenstadt both managed 2m 21.6s to occupy row 6, while Brian Hart was forced to miss the race despite a 2m 21.8s time when his engine failed in the morning session. The rest of the grid was filled by Henri Grandsire in an Alpine, David Prophet’s Brabham, Schlesser, Silvio Moser in a Brabham, Lucien Bianchi in an Alpine, Mario Cabral in his first F2 race driving a Brabham, Guy Ligier’s Brabham, and finally Paul Hawkins’ Lola. Fine weather greeted the 4pm start and it was Rindt who got away best, holding off a charging Clark to lead as they passed the pits for the first time. Rees held down 3rd spot, with Attwood, Brabham, Hulme and Hill close behind. Meanwhile Bianchi pulled off with a blown head gasket. At the end of the 2nd lap, Rindt was clearly holding Clark up, and the Scot moved to pass him as they crossed the line. Rees led Brabham in 3rd and 4th, while Hill had passed both Attwood and Hulme. Further back, Cabral’s first F2 race ended violently, when he crashed heavily into the woods just after the beginning of the back straight, and was seriously injured. Next time around Clark was in front, closely followed by Rindt and Rees, while Gardner passed Attwood for 6th. Stewart brought his BRM in for some work, with his car suffering from low oil pressure at the hairpin and low power on the straights, and Guy Ligier retired his Brabham. A lap later Attwood was forced in to try to sort out his car’s fuel starvation problems. Over the next few laps the front three of Clark, Rindt and Rees began to open up a small gap on the rest of the field, while further back Grandsire began to have trouble with a rough sounding Renault engine. On lap 14 Hill made his move, passing Brabham and slipstreaming onto the tail of Rindt with a blistering 2m 16.9s lap, allowing Clark to get his lead out to almost 2 seconds. While this was happening, Rees trailed into the pits to retire with mechanical problems, with Schlesser doing the same shortly afterwards. With Hill keeping Rindt fully occupied and Brabham having a watching brief over the two of them, Clark was free to really get some distance ahead. By lap 23, half distance, his lead had shot out to 8.4 seconds. Brabham still sat in 4th, but was starting to have some engine problems, while Gardner was clear in 5th. Beckwith, Hulme and Spence were next, but on lap 24 Hulme had to dive into the pits to have a new battery fitted. Revson was all alone next up, having got away from Bondurant who was struggling with a down on power engine, ahead of Hawkins, Maglia and Offenstadt. Prophet meanwhile had pitted, and ran last of the 13 remaining cars. Moser and Grandsire retired at this point, both suffering from mechanical maladies. Lap 28 saw rain start to fall, and Hill finally won the battle with Rindt when the Austrian’s engine failed in a big way on lap 31. Brabham was slowed by the stricken Rindt, losing his slipstream, and allowing Hill to get away a bit, while Gardner had slipped behind Beckwith after having a moment and was now a lap behind Clark. Offenstadt was next followed by Hulme, Hawkins, Maglia and Revson, who had had his 2nd off of the day spinning on his own oil, but had managed to resume. Spence had retired while Prophet had finished his day in the ditch at Scierie. Englishman Piers Courage was clearly the fastest of the qualifiers for the annual Coupe de Vitesse for F3 cars. His time of 2. 25.1s was a full 6.3 seconds faster than Jackie Stewart’s best F3 time from 1964. John Fenning was almost 2 seconds behind in 2nd, with Cardwell leading the rest a further 0.4 seconds slower. Fenning got away best at the start, but Courage got by him on the run down to Six Frères, and led at the end of the lap from Blokdyk, Fenning, Cardwell, Beltoise and Regazzoni. Blokdyk spun at Nouveau Monde to drop back to seventh, but Courage was careering away with a 10-second lead by lap 8. Cardwell retired on lap 9, leaving Fenning and Beltoise to fight over second place, while Blokdyk recovered to get ahead of Weber and Regazzoni and into 4th. Blokdyk now began setting a string of fastest laps, culminating in a 2m 26s on lap 16. This allowed him to get by Fenning, and then blast past Beltoise. 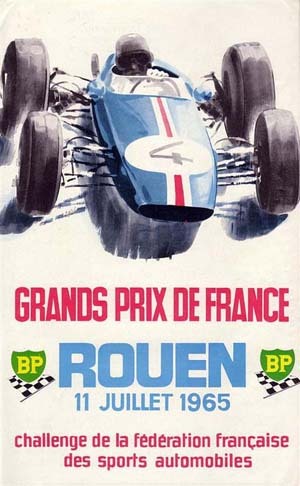 Courage, meanwhile, began to have problems with his engine, but managed to hold on to win, while Beltoise slipstreamed back past Blokdyk on the last lap to claim second, 3.9 seconds behind.